Is there anything better than finding a book that you love? Maybe it’s an entire series of books that you love? Or better yet, maybe its finding a book series that you and your kids love as well!! I know, that thought almost doesn’t seem possible, but it certainly can be. I am experiencing that very phenomenon right now, with the Artemis Fowl series! 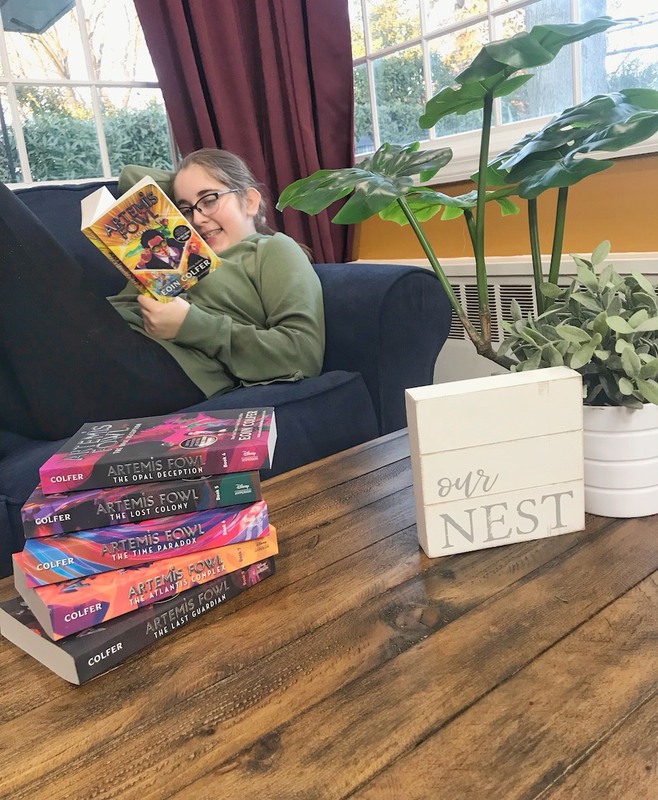 That’s why I was all about working on this sponsored post in partnership with Disney Book Group. All opinions and love are my own. I’ve loved the books for a while now, and I don’t like change just for changes sake. That being said, some change can be very good. 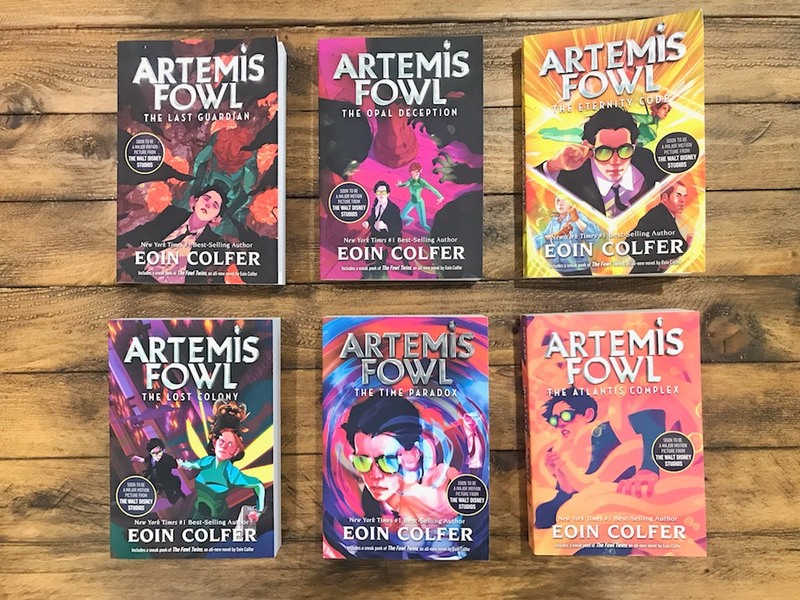 For example, the new re-designed packaging for Artemis Fowl is really slick and unique. Natalie and I are loving the new look. Each cover just pops now with awesome artwork that really speaks to the fun adventures inside those covers. The complete series in re-designed packaging is now available in stores! Isn’t a great story with awesome new artwork enough for you? Well, I hope it is, because it’s enough for me. If for some reason it’s not enough to really get you excited, there’s more I wanted to share. More goodies, baby, for you to enjoy!!! 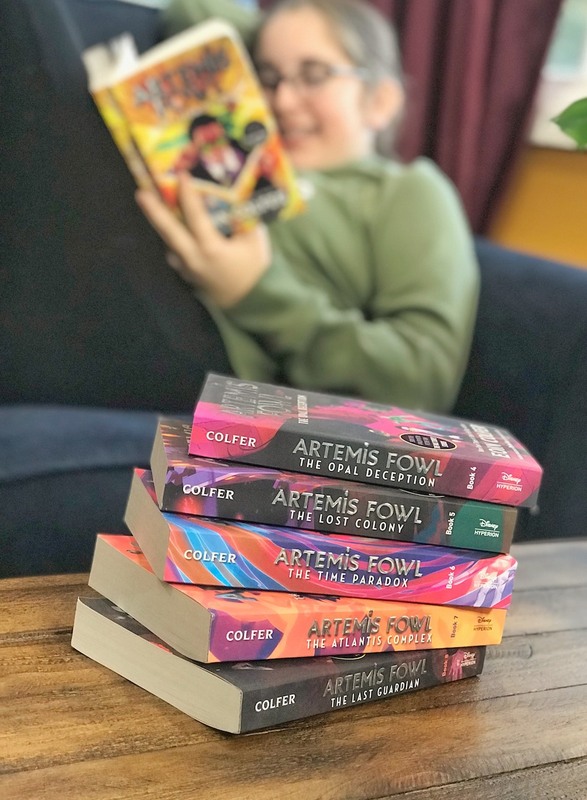 Each book includes a sneak peek of The Fowl Twins, a brand-new spinoff novel following the adventures of Artemis Fowl’s twin brothers. How cool is that?? I cannot wait for this new novel to come out. I’m sure it’s going to be just as fantastic as the Artemis Fowl books are!!! If you are feeling the love from the books but could still use more, I have some awesome news for you. Very soon you are going to get the chance to see all the Artemis Fowl characters and storylines you love on the big screen! You can be right there, immersed in it all. Will the movie be as good as the books? I bet it will be!! 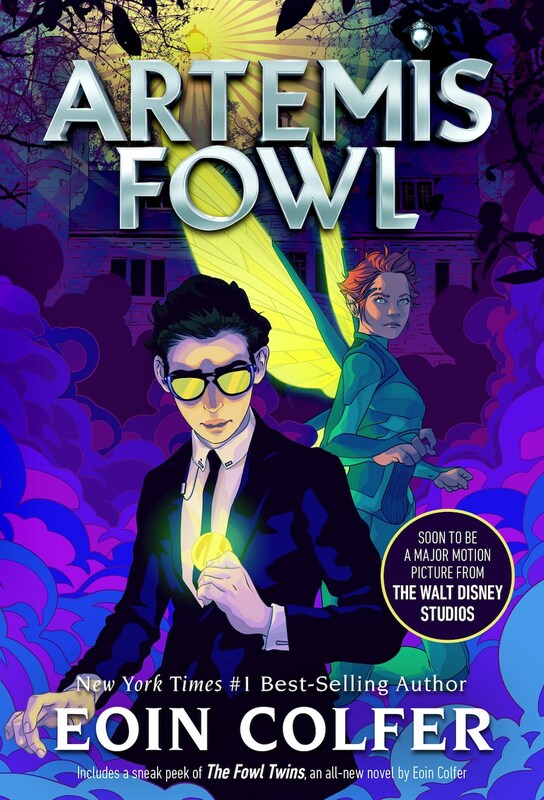 Artemis Fowl is soon to be a major motion picture from The Walt Disney Studios in August! Check out the amazing teaser trailer right here and below!!! How about a little fun?? I just wanted an awesome part of the Artemis Fowl series with you. It’s called Gnommish and “fairy language” used in the books. It is not actually a language, but more of a cipher/code where each symbol represents a letter. Lines of Gnommish run along the bottoms of books one, two, four, five and six. It’s just yet another creative and fun part of the books that keeps it interesting and entertaining book after book!!! Here’s the symbols…maybe we could exchange some messages later? See how you do with the decoding!! I wanted to share the good news with you in Gnommish!! It’s long, but try to figure it out yourself with the key above. If you’re having trouble, I have the translation*** at the bottom of this post!!! 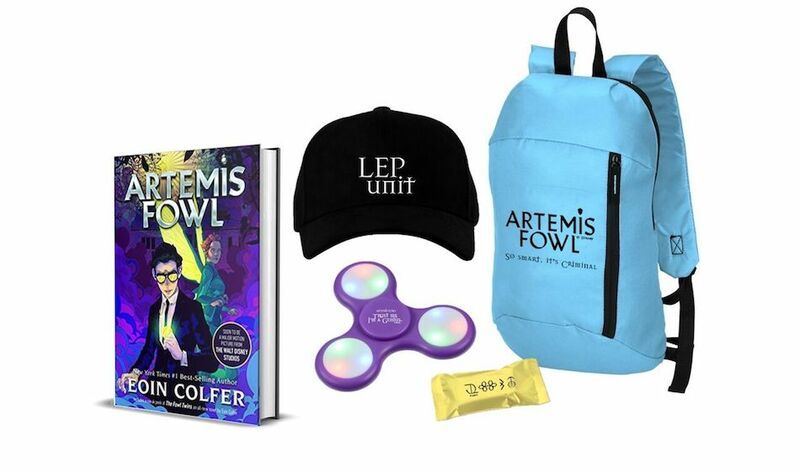 Plus limited edition merchandise: backpack, hat, fidget spinner and chocolate!! Winner must have a U.S. mailing address. Prizing provided by Disney Book Group. 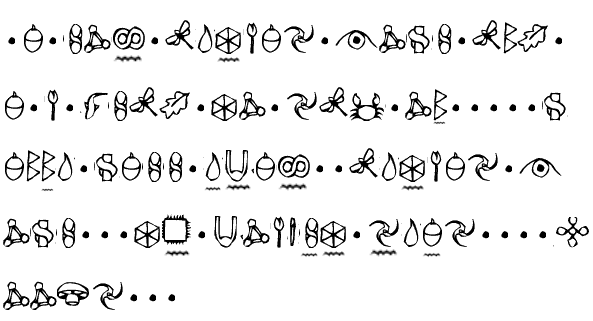 I hope you could decode the Gnommish message. If you can, I think you will like what it says!!! Pick up the series and see how great it is for yourself! The Artemis Fowl series is written by Eoin Colfer and published by Disney-Hyperion. The series is recommended for ages 8+. My youngest is going to be so excited to hear that Artemis Fowl is going to be a movie. It’s one of his favorite book series. I’ll bet they’d decode that in seconds too! I saw that this was coming to the theaters, I told my kids and they got excited! We watched the trailer and that made it even more exciting! When I heard that this was coming to the theaters, I told my kids and they got excited! We watched the trailer and that made it even more exciting! The preview looks amazing! I will watch anything Disney; thank you for sharing! We can’t wait to see this! Thanks for the chance to win the book set. I’ve only recently heard about Artemis Fowl. No kidding! I watched the trailer, and it looks fun! That is a great giveaway! Looking forward to the movie with my kids. It makes me happy to see that your children love books and reading. That is a very good habit. I will let my nieces know about the coming movie. I am positive they will be excited to see it. Wow, my middle schooler would love this! I need to show her these codes and the books! This looks like such a great book series! I will pass this on to my niece! She would love it! Didn’t know about these. My husband’s niece would like these. She’s into reading book series. This series looks like something that my son would really like. I am gonna have to check it out for him! I would love to win these books for my daughter! I haven’t heard of this book not until now. Artemis Fowl seems like a fun read! I would like to tell it to my niece who loves to read books. My daughter wants to read these books. Thanks for the chance. My nephew is so addicted to the Artemis Fowl’s books and he cannot put it down. I cannot wait to see his reaction when he knows there is a movie coming up. My boys love mystery books.